Chemicals are the cheapest way to remove a tree stump but you’ll have to be patient. A stump grinder is a tool designed just for stump removal but they’re expensive. A chainsaw will also get the job done. I’ve included several videos so you can see how to remove a tree stump from your yard. Chemicals is the cheapest way to remove a tree stump but it does take time for it to work. No need to pull out that chainsaw or stump grinder; instead you can use a chemical based solution that we’ve outlined below. It’s not as quick or as clean as removing the stump physically but it will work if you’re someone who isn’t comfortable using a chainsaw or don’t have access to a stump grinder. How to remove a tree stump? Well, chemicals are the cheapest way but this method requires a lot of patience. Use the Spectracide Stump Remover to destroy stumps by drilling holes into the actual stump, up to 12″ deep. 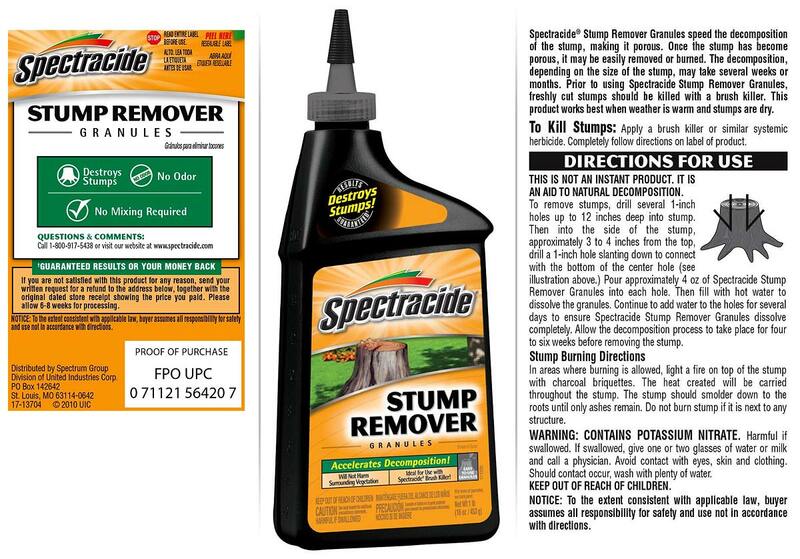 The Spectracide Stump Remover simply accelerates the decomposition of the stump. Don’t expect an instant fix. It may take 2 to 6 months to reduce your stump to a state where you can easily dig it out and clear it from your yard. Speeds up stump decomposition with chemicals. Comes with an easy to apply application system. Bayer Advanced Brush Killer Plus Concentrate will allow you to kill difficult to remove brushes, vines, weed, just to name a few. This product will kill 70+ types of vines, brushes and weeds — including roots. Perfect for homeowners. You can also buy the Bayer Advanced Brush Killer in the large 1 gallon size. Kills difficult brush, including roots. Kills over 70 types of weeds and brush. Ideal for: Brush, vines, and other woody plants such as Poison Ivy, Poison Oak, Blackberry, Wild Berries and Bushy Plants, Kudzu, Stumps, Broadleaf Weeds. DETAILS: Bonide Stump-Out Stump & Vine Killer. The Bonide Stump-Out Stump & Vine Killer is use to use with the included applicator that allows you to dab the poison using the little dabber that’s built into the cap. Fast-acting stump and vine killer. Prevents the return of shoots and suckers. Quick acting uptake of chemical allows for fast results. Handy applicator to cut stumps and vines. Grinds stumps from 10″ above grade to 9″ below grade. Watch the video below of the NorthStar Power Stump Grinder in action. I can sit here and write a detailed overview of this product or you can simply see how capable it is in this short video. Compact design. Small enough to fit in the back of your car or SUV. 9 2/3″ (diameter) x 3/8″ cutting wheel with 4 durable carbide-tipped teeth. Side discharge directs shavings away from stump grinder wheel & frame. Ergonomic Handle and frame for greater comfort & less fatigue. Tri-Power molded gates belt (EPDM) increases heat resistance & provides smoother operation. Folding handle for easy storage & comfortable operating controls. 12″ wheels makes it easy to maneuver in all types of terrain. The Northstar stump grinder seems to sell out often so if it’s unavailable you might want to consider buying the ECHO SG340 Bear Cat stump grinder. Put on your safety equipment, including: boots, hearing protection, goggles, helmet, and gloves. Remove loose dirt and/or debris from around the stump. You can even dig some of the dirt to allow you to cut more of the stump. Remember, you don’t want to allow yourself sufficient room to operate your chainsaw. Make a horizontal cut about one foot from the ground. Work your way around the stump as you cut and be careful not to use the tip of your guide bar. Now that the wedge is placed you can remove your pinched chainsaw. Resume cutting your stump and finish the cut. Remember to leave your wedge in place. Once the cut is complete, push the log off the stump. 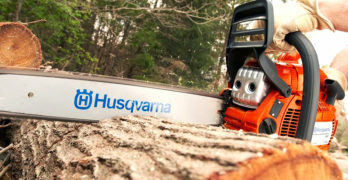 If you’re interested in removing a stump with a chainsaw but haven’t purchased one yet then check out some of our resources first. I always suggest that people new to chainsaws start with our buying guide. 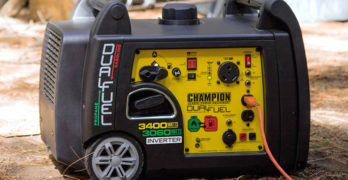 At the end of that guide you’ll find various links to specific chainsaw types such as gas chainsaws — which are the best choice if you’re looking for power. Read our corded chainsaw guide for light-to-medium duty cutting, and for the ultimate in portability around the home, have a look at our battery chainsaw guide. If you need to cut from an elevated position then you’ll be interested in our top handle chainsaw guide, and lastly if you’re just looking for cheap chainsaws, we have something for you as well.